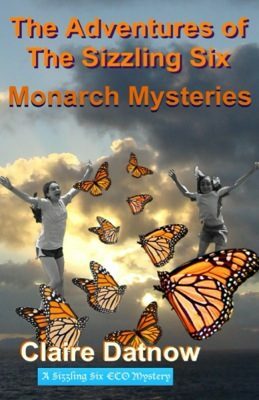 In Monarch Mysteries, the cast of plucky teenage girls pit themselves against foolish neighbors and uninformed city officials. Our heroines, The Sizzling Six, soon find themselves drawn into a complicated eco mystery by Mrs. Margarita Mariposa, their mysterious neighbor, who plants wildflowers in her garden and in the fields to attract monarch butterflies. The villain, Mr. Patrick Prickles, is a troublemaker who is out to destroy Mrs. Mariposa’s good work. At the urging of Mr. Prickles, the city threatens to fine Mrs. Mariposa if she does not cut down the tall “weeds” in her yard. To add to the problems, Mr. Prickles is determined to mow down milkweed where the monarch butterflies lay their eggs. The climax comes when tens of millions of monarchs, overwintering in Mexico, die in a terrible freeze. Will the remaining monarchs survive the long migration back to the United States and Canada? Can the Sizzling Six help save the monarchs before it is too late? With a touch of humor and swift plotting this eco mystery makes for an exciting read! Also see Claire’s environmental blog.